China's next generation bullet train "Fuxing" debuted on the Beijing-Shanghai line on Monday. A CR400AF model departed Beijing South Railway Station at 11:05 a.m. for Shanghai. At the same time, the CR400BF model left Shanghai Hongqiao Railway Station for Beijing. The new bullet trains, also known as electric multiple units (EMU),boast top speeds of 400 kilometers an hour and a consistent speed of 350 kilometers an hour. The train was designed and manufactured by China. The train includes a sophisticated monitoring system that constantly checks its performance and automatically slows the train in case of emergencies or abnormal conditions. Thanks to a remote data-transmission system, a control center will be able to monitor the train in real time. 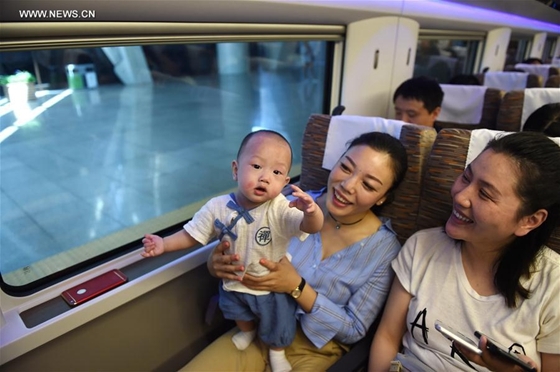 Lu Dongfu, general manager of China Railway Corp., operator of the new train, said "Fuxing" (rejuvenation), underpins the unique role that high-speed railway has played in China's economic and social development. Previous bullet trains featured the characters "Hexiehao" (harmony), on the exterior of each train. China has the world's longest railway network, 22,000 kilometers by the end of 2016, about 60 percent of the world's total. Beijing-Shanghai railway line is China's busiest route, used by 50,5000 passengers daily.